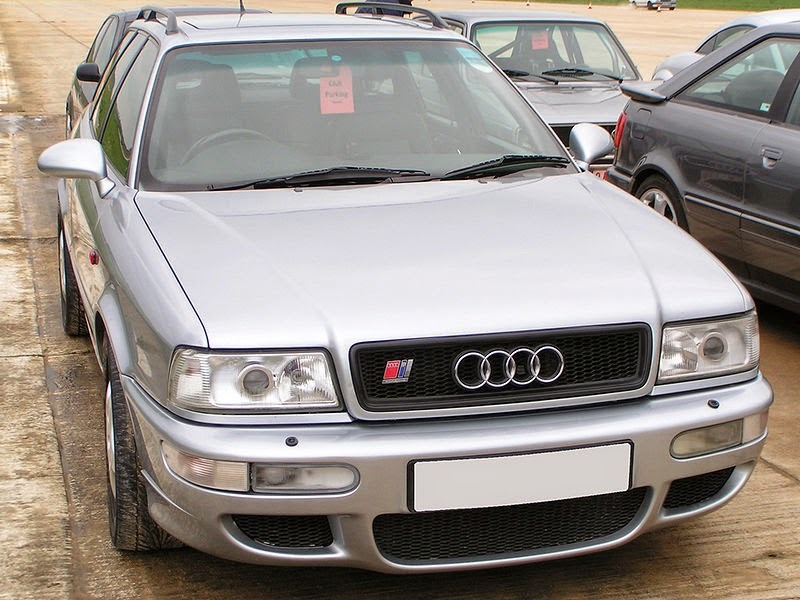 The Audi RS2 Avant was a limited edition, high-performance Audi five-door, five-seat estate car (station wagon), manufactured from March 1994 to July 1995. Collaboratively designed as a joint venture between Audi AG and Porsche and built on Audi's 80 Avant, designated internally as P1 (instead of B4/8C that it was based on). It was Audi's first "RS" vehicle, and the first of their high-performance Avants (Audi's name for an estate car or station wagon); it used the most powerful and most thoroughly developed version of Audi's inline-five cylinder turbocharged internal combustion engine. 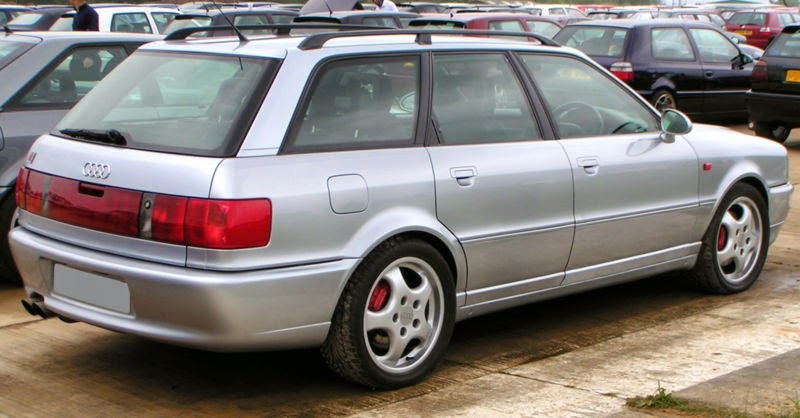 Although it was not widely exported outside of Europe, except for a few to Hong Kong, South Africa, Brazil and New Zealand, the RS2 has amassed an impressive cult following worldwide, and it is often regarded as being the vehicle that finally firmly established Audi as a producer of practical high-performance vehicles: its estate body, seating for five persons, and Audi's 'trademark' quattro permanent four-wheel-drive system as standard made it usable as a comfortable daily driver, even in poor weather conditions. The "RS" initials stand for RennSport (from German, literally translated as "racing sport"), and is Audi's highest performance 'top-tier' trim level, positioned distinctly above the "S" ("Sport") specification level of Audi's regular model range. RS cars are usually produced in limited numbers over a limited time scale, and pioneer some of Audi's latest and most advanced technology and engineering prowess; therefore, "RS" cars could be described as halo cars. Whilst RS cars generally command a much higher purchase price, compared with their 'lesser' brethren, they also retain very high residual values too. The RS2 was the product of a co-development project between Audi and Porsche, based on Audi's 80 Avant, and built on the Volkswagen Group B4 platform. It was powered by a modified version of their 2.2 litre inline five-cylinder 20-valve turbocharged petrol engine (parts code prefix: 034, identification code: ADU). This internal combustion engine produced a motive power output of 232 kilowatts (315 PS; 311 bhp) at 6,500 revolutions per minute (rpm). Although much of the car's underpinnings were manufactured by Audi, assembly was handled by Porsche at their Rossle-Bau plant in Zuffenhausen, Germany, which had become available after discontinuation of the Mercedes-Benz 500E, which Porsche had manufactured there under contract. The Rossle-Bau plant also produced the famous Porsche 959. 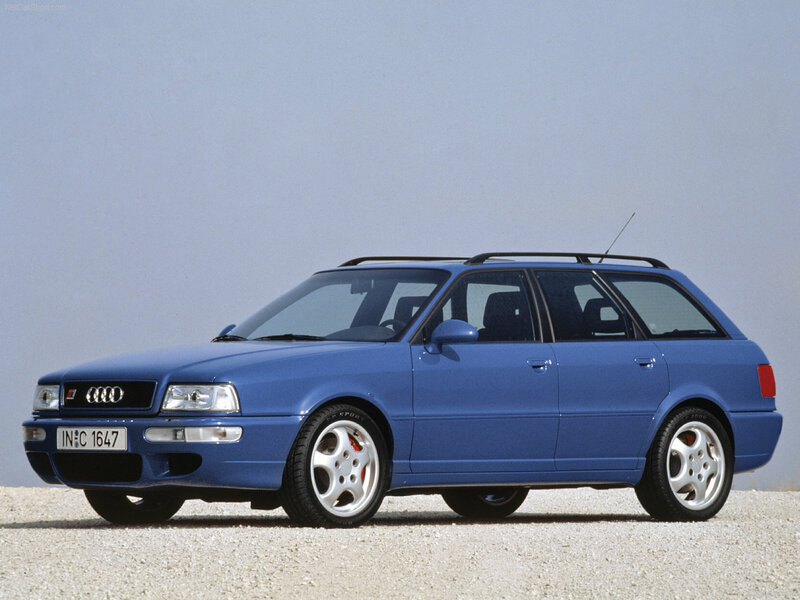 Like the rest of the vehicle, the RS2's five-cylinder engine was based on a unit that Audi already produced, although Porsche considerably modified the engine; the standard KKK turbocharger was switched for a larger unit, along with a heavy-duty intercooler and higher flow fuel injectors, a newly designed camshaft, a more efficient induction system, and a low-pressure exhaust system replaced the standard fare; a new Bosch-supplied engine management system (ECU) controlled the engine. With so much power available, the RS2 could accelerate from 0 to 100 kilometres per hour (62.1 mph) in 4.8 seconds, and achieve a maximum speed of 262 km/h (162.8 mph) (electronically restricted), despite weighing over 1,600 kilograms (3,527 lb). In a road test conducted in 1995, British car magazine Autocar timed the RS2 from 0 to 30 mph (48 km/h) at just 1.5 seconds, which they confirmed was faster than both the McLaren F1 road car, and also Jacques Villeneuve's Formula One car of that time. Even by more modern standards, its performance is exceptional; it could accelerate on-par with the C5 generation Chevrolet Corvette and a 996 generation Porsche 911. The top speed was 166 mph. A six-speed manual gearbox (parts code prefix: 01E, identification code: CRB) (gear ratios - 1st: 3.500, 2nd: 1.889, 3rd: 1.320, 4th: 1.034, 5th: 0.857, 6th: 0.711) was the only transmission choice. Audi's Torsen-based 'trademark' quattro permanent four-wheel drive system was standard. Front and rear final drive units contained a conventional 'open' differential, and have a ratio of 4.111, although the rear (parts code prefix: 01H, identification code: AZE) also has an electro-mechanical diff lock. Porsche-designed braking and suspension systems replaced the standard Audi 80 equipment, however, the Bosch Anti-lock Braking System (ABS) was retained. The front brakes feature either 304 millimetres (11.97 in) in diameter by 32 mm (1.260 in) thick radially vented brake discs, and use Brembo four-opposed piston fixed calipers, or a 'modified' option of larger discs (which will only fit under a 17" wheel) of 322 mm (12.68 in) by 32 mm (1.260 in), with uprated brake pads. The rears featured 299 mm (11.77 in) by 24 mm (0.945 in) radially vented discs, again with Brembo four-piston calipers, and the 'modified' option included identical sized discs, but merely included cross-drilling, along with uprated pads. The handbrake worked on the rears, and consisted of a cable operated 'drum in disc' system. 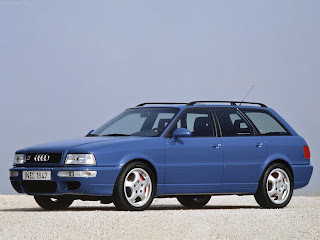 40 millimetres (1.6 in) lower than a standard 80 Avant, the suspension and braking upgrades combined to give the RS2 the handling and braking capabilities of a high-end sports car; 7.0Jx17 inch Porsche 'Cup' roadwheels, and high-performance 245/40 ZR17 Dunlop tyres were standard as well. In fact, the braking system wore Porsche-badged Brembo calipers, and both the wheels and side mirrors were identical in design to those of the 964 Turbo. Additionally, the word "PORSCHE" is inscribed in the RS2 emblem affixed to the rear tailgate and front grille. A three-spoke leather steering wheel, Recaro sports-bucket seats (available in full leather or a leather/suede combination), and console materials in either wood or carbon fibre trim rounded out the vehicle's interior changes. Audi's proprietary Safety Restraint System, procon-ten remained from its donor vehicle. Approximately 2200 RS2s were to be built initially, but due to demand the total was 2891 cars built. Of these, only 180 were right hand drive cars built for the UK, New Zealand and South African markets. Audi also produced an S2, which was available both as an Avant (estate) and a Coupé, as well as saloon model with only 306 models built. It featured a similar turbocharged 2.2 litre five-cylinder engine which delivered 162 kW (220 PS; 217 bhp) (3B engine), or 169 kW (230 PS; 227 bhp) (ABY engine). Last updated on 3 February 2014 at 20:13.